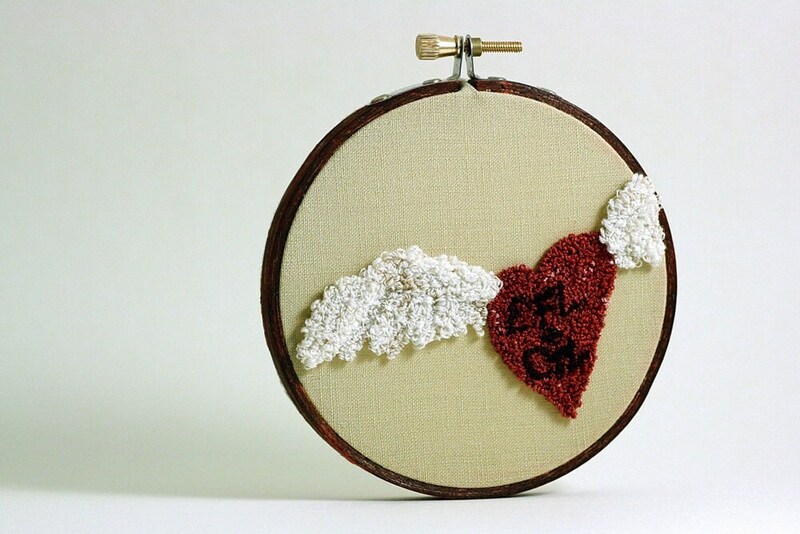 I created this winged heart in punchneedle embroidery. Punch Needle or Needle Punch, is an ancient rug-hooking technique shrunken down onto a much smaller scale and uses a special twice-threaded hollow needle, embroidery floss and weaver's cloth. Each tiny loop is painstakingly and meticulously hand punched with love by me. This would make a lovely wedding gift or a treat for that special someone in your life! Simply indicate the initials you'd like to order upon purchase in the "notes to seller" and I'll get started! I really went wild with the different settings on my adjustable punchneedle with this piece, the wing feathers are all different lengths of loops creating a stunning effect. The design was created by me, transferred on weaver's cloth and permanently attached to a 4 inch (10.2 cm) decorative hoop that I've stained a rich brown. A 4 inch (10.2 cm) circle of eco-felt (made from 100% post consumer plastic bottles) is attached to the back. PLEASE NOTE: This item is a custom order that will take up to 7 full days to create. Please check shop announcement as busy times could lead to longer wait times. Some elements may vary just slightly depending upon availability of products needed to create the artwork. I endeavor to stick as closely to original as possible but sometimes thread shades will vary slightly - as they are hand dyed. The winged heart arrives in pretty eco-friendly packaging all set for gift giving and comes with a small brass nail for hanging! Please indicate initials you'd like in the "notes to seller" it can be three initials for each (As shown here) or just two. Acorn Punch Needle Embroidery Hoop Art. Eco Friendly Home Decor. Woodland Theme - Forest. Brown Caramel Gold. 3 Inch Hoop. Gold Maple Leaf Autumn Punch Needle Embroidery Hoop Art. Eco Friendly Home Decor. Rustic, Woodland. Yellow, Red. 3 Inch Hoop.